English visual artist, born 25 June 1932 in Dartford, Kent. Sir Peter Thomas Blake CBE, RDI, RA ( is one of the worlds leading exponents of ‘Pop Art’, and has worked extensively in both the UK, and internationally. He is also known as a jazz music fan. He is probably best known in the music industry for his album design work, the most famous of which is the cover he created, together with Jann Haworth (married until 1979, then divorced), for The Beatles "Sgt. Pepper's Lonely Hearts Club Band" (1967). In 1980, Blake met fellow artist Chrissy Wilson, they married in 1987, and have a daughter, Rose Blake. 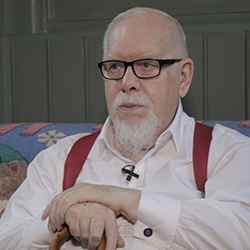 In February 2005, the Sir Peter Blake Music Art Gallery, located in the School of Music, University of Leeds, was opened by the artist. The permanent exhibition features 20 examples of Blake's album sleeve art, including the only public showing of a signed print of his "Sgt. Pepper's" artwork. Amongst other awards, Blake became a Royal Academician (RA) in 1981, received a Commander of the Order of the British Empire (CBE) in 1983, and in 2002 he was awarded the title Knight Bachelor for his services to art. He is also a member of Royal Designers for Industry (RDI).